Since metallic raw materials are scarce in Germany, it is reliant on imports. Yet some of these valuable materials are lying around unnoticed in dumps. Fraunhofer researchers are now compiling a Germany-wide registry of these resources, which reveals where these deposits are located and what metals they contain. When it comes to important raw materials, Germany is dependent on imports – a situation that government and industry would love to change. Could we possibly have buried things in dumps that we could still use? Might the blast-furnace slag, converter dust, or blast-furnace gas sludge deposited in metallurgical dumps still contain some usable metal here and there? To this day, we simply do not have enough information. While the UMSICHT researchers wade through the archives, their colleagues at EFTAS Fernerkundung Technologietransfer GmbH analyze satellite data for specific test regions, which include the Saarland, the western Ruhr area, and the Mansfeld Land region in Saxony-Anhalt. Using automated processes, they identify possible dump sites from the images. The UMSICHT scientists then compare this data against their own findings and send their conclusions back to EFTAS. "In this way, we are helping to optimize remote satellite identification for this task," says Dr. Asja Mrotzek, group manager at UMSICHT. "In future, the method might conceivably be used for the detection of deposit sites worldwide – even in regions whose archives hold less data." sonnel at FEhS carried out chemical analyses. This yielded a precise itemization of the materials the samples contained. The partners at Martin Luther University investigated the samples using reflection spectrometry measurements to discover the materials' spectral fingerprint. By comparing the results with the chemical analyses, they create a database. "This allows people to do targeted searches: You could use the measurement technology on unknown dumps to get initial rough data about which materials the site contains," explains Nühlen. "Then you could carry out further analyses on potentially interesting locations." So what do the dumps actually contain? "Mostly iron, depending on the process," says Mrotzek. "Phosphate-rich slag was also buried there, which can be used directly as fertilizer for instance. Under certain conditions, waste material with high iron content can be reused in the iron and steel industry." In a further stage, UMSICHT researchers will now carry out a cost-effectiveness analysis. 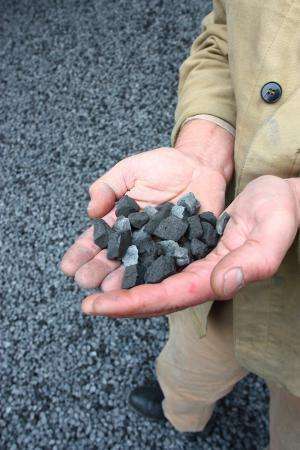 Is it profitable to extract these materials from the dumps now or – depending on how the price for the raw material develops – only in five or ten years' time? After all, it is not just a matter of extracting the raw materials for the sake of it – it also has to be profitable. Over several years, I worked on many projects looking at the recovery of metals from waste streams. It is amazing that as soon as something it labelled a "waste product" that the value of the contained metal is simply ignored, with much of it ending up in landfill or with waste companies that would only recover a small fraction of the metal value, often none at all.